Well here we are hurtling into March and still no real winter. A couple more weeks and it will be spring, though you might think it had already arrived. 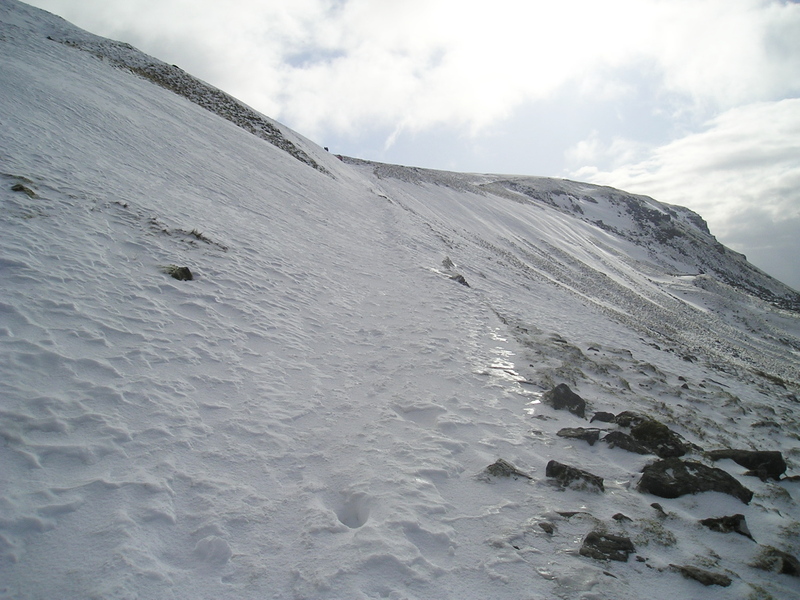 In post #65 I told the story of a very unseasonal (and summery) February day on Cadair Idris in 2008, but sometimes it works the other way round. 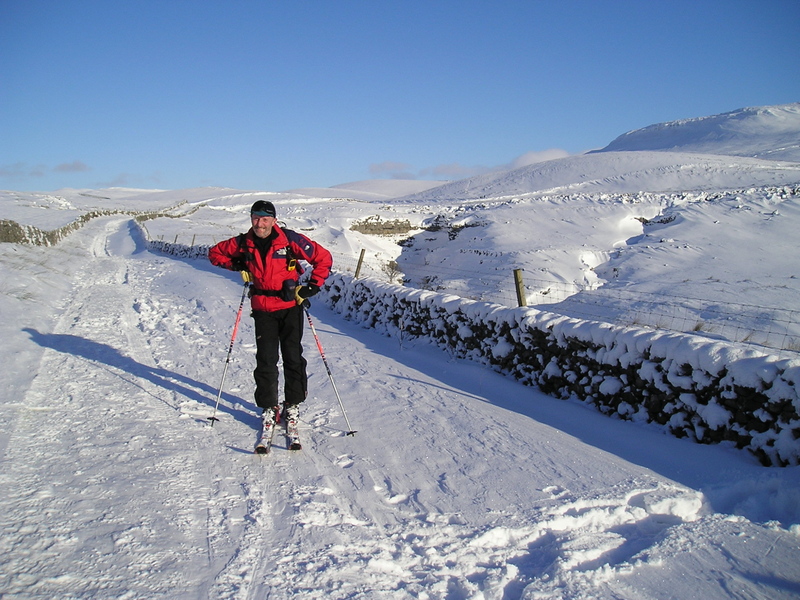 In January 2010 there was enough snow to ski from the roadside at Horton-in-Ribblesdale. 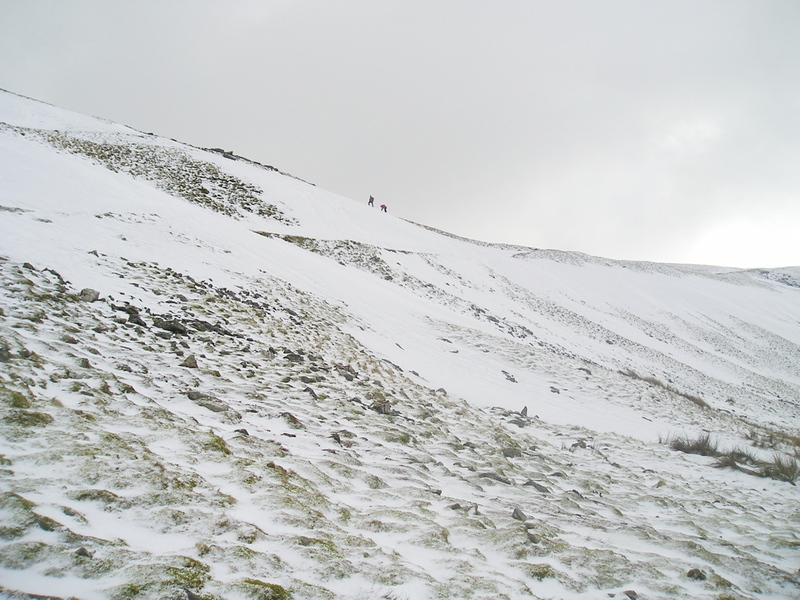 With that possibility there could only be one target – Pen y Ghent. Horton Lane was wall to wall snow – this had mostly consolidated into bumps and dips with the consistency of concrete, with overlying powder in places. It made ‘interesting’ skiing when the time came to return. 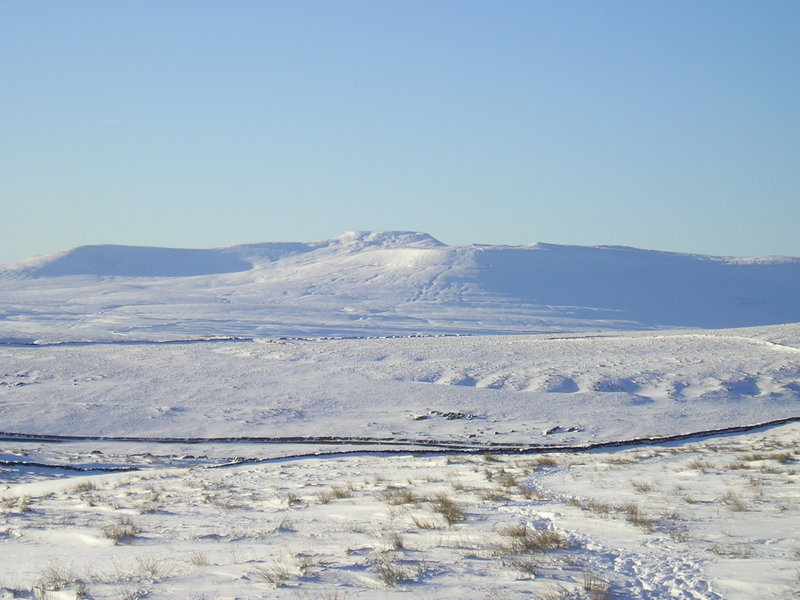 The air was clear as a bell, as the image of Ingleborough shows. Once I left the lane, I expected to have a tussle at the gates and stiles on the way up – again the photo tells a story that hardly needs a caption. Two other walkers were also heading upwards at the same time – my mountain-ski gear is old and heavy compared with my modern downhill kit, but even with the extra weight I had a clear advantage over the walkers on the soft powder sections. 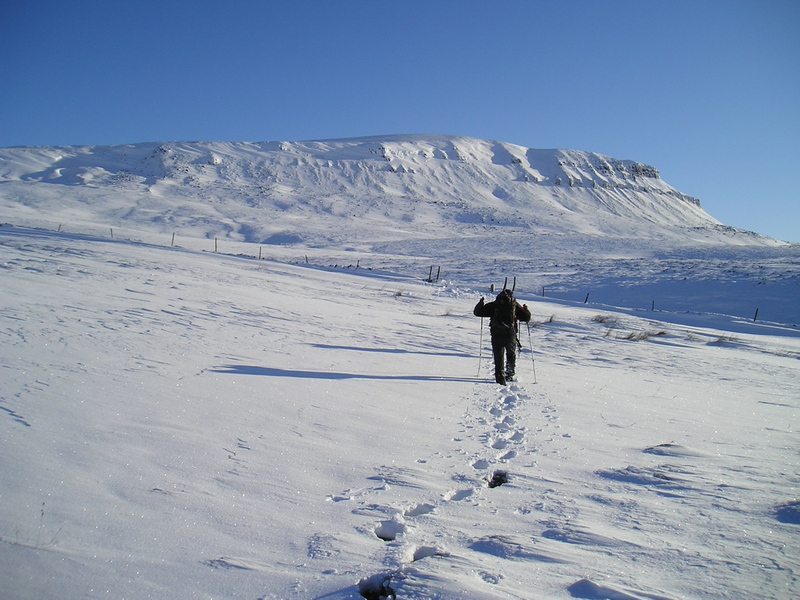 Pen y Ghent crags – note the cornice formation! When I arrived underneath Pen y Ghent Crags, it was like a Christmas cake! 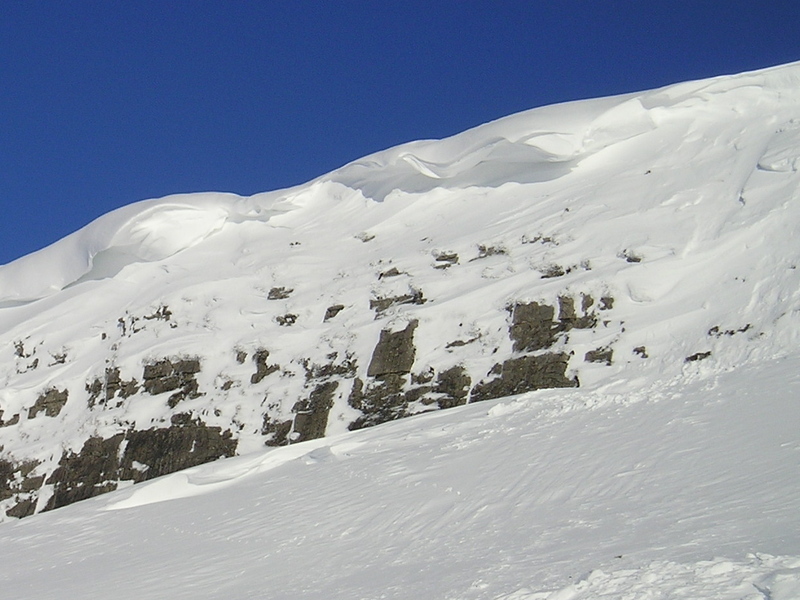 Big overhanging cornices were quite evident, and a small amount of avalanche debris indicated that part of the cornice had already collapsed. It would certainly have spoiled your day if that lot had ended up down the back of your neck! 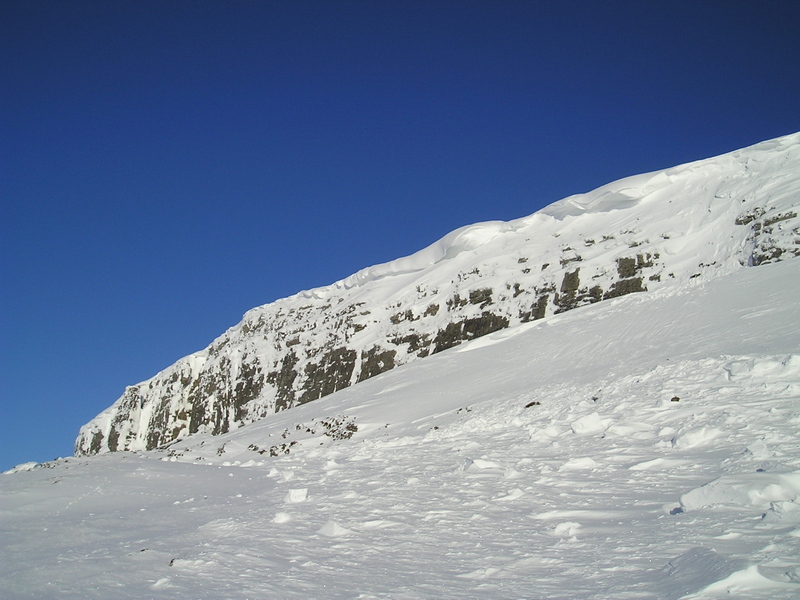 The last section to the summit proved to be a bit problematic – the line I had taken was a gradual ascent which didn’t quite follow the summer path. It wasn’t long before I was in deep and steep powder, that was breaking away under my skis – I didn’t really fancy trying to race the slope down if it broke away, so with the summit about 600 metres away I did the sensible thing, executed a ‘kick turn’ and headed down to safer ground. A month later (February) the bulk of the snow had gone, but the photo of the summit shelter shows that there was still quite a bit on the tops. The snow on the summer path was hard and like glass, which wasn’t a problem until it got steeper. As the path steepened I became aware of the slope below, where the ‘run-out’ was directly into a section of scree – just enough time to accelerate before getting shredded amongst the rocks! I took a lot of time and care on a section that people skip down in summer – crampons or ‘Kahtoola spikes’ would have made life so much easier. Having got down safely I kept an anxious eye on the couple behind me, but they teetered down without incident. 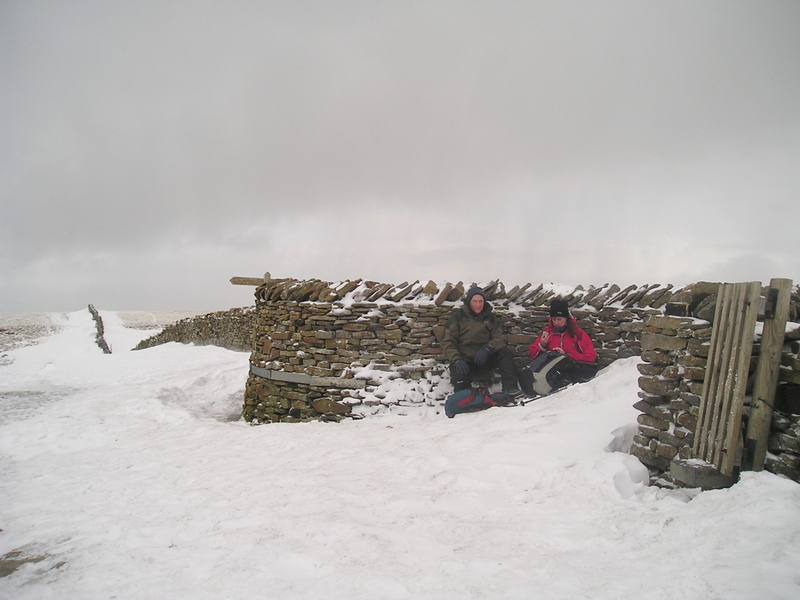 Two good days out in the snow – so what happened this year then?!! This entry was posted in 3. 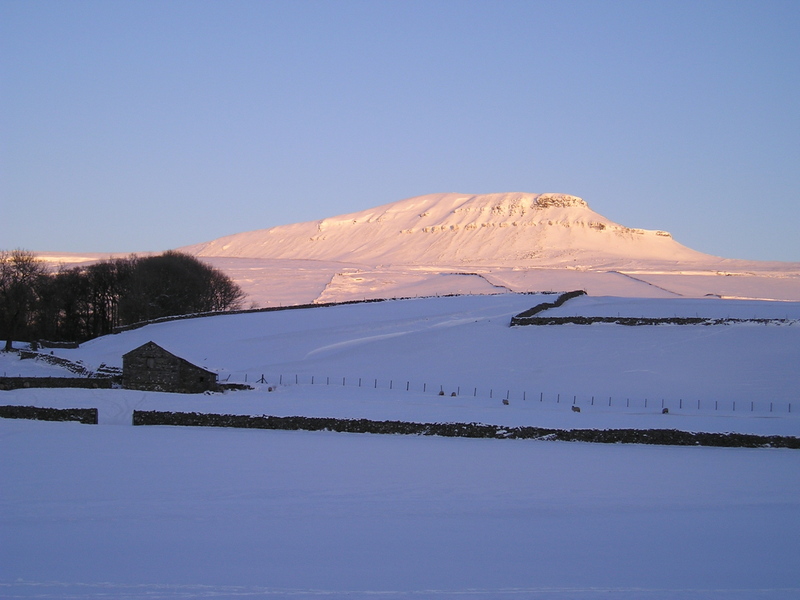 Yorkshire Dales and tagged mountains, Pen y Ghent, Pennine Way, photography, skiing, winter. Bookmark the permalink. Thanks for looking in Kurt, and for the comment. 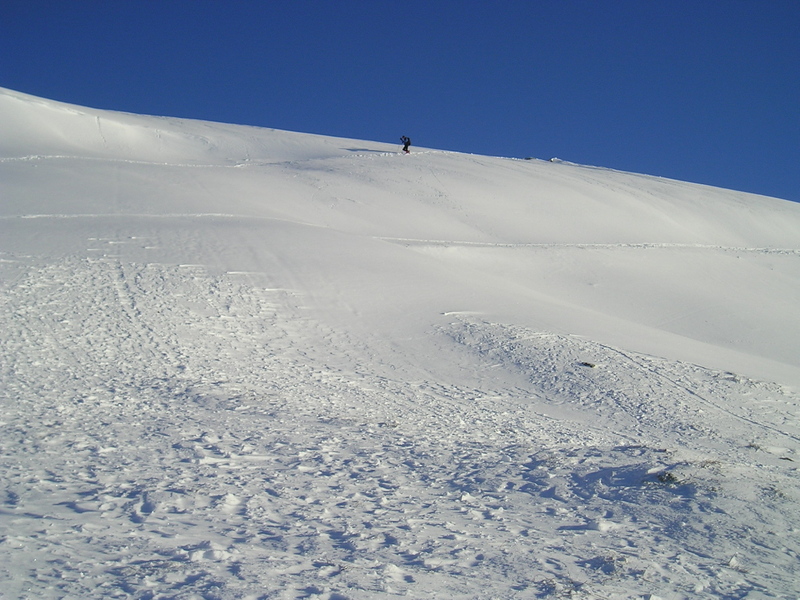 Brilliant Paul, it was a great year for snow, I watched a few people in Wales on ski’s that year and their were plenty of tracks going down the glyders were people had been…. I,m to much of a wimp to have a go…never done it dont think I ever will 😦 the missus has got a friend who is a ski instructor too…. how scared is that..
We have several pairs of x country skis languishing in our loft – and what’s left of the boots after a mouse attack one year. We’ve never done anything very exciting with them – just played about on some hillocks at Hartside. It’s one of those things that looks effortless, like sailing, but isn’t when you try it as a novice (and a wimp). We only went round one of the local fields last time there was a bit of snow here and I discovered tendons, ligaments and muscles I didn’t know I had. Ouch! 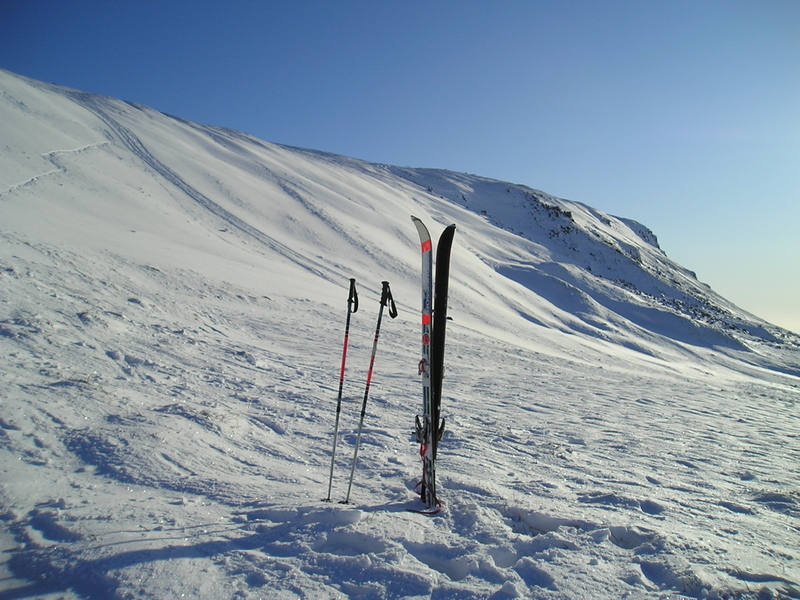 The skis I used on this trip are mountaineering skis with touring bindings that lock down – heavier than X-country but more stable and easier to control. Fantastic photos Paul- especially the first which looks like an abstract painting! Glad you put a ‘photography’ tag on that post – those photos are stunning! They make mine look sick that’s for sure! 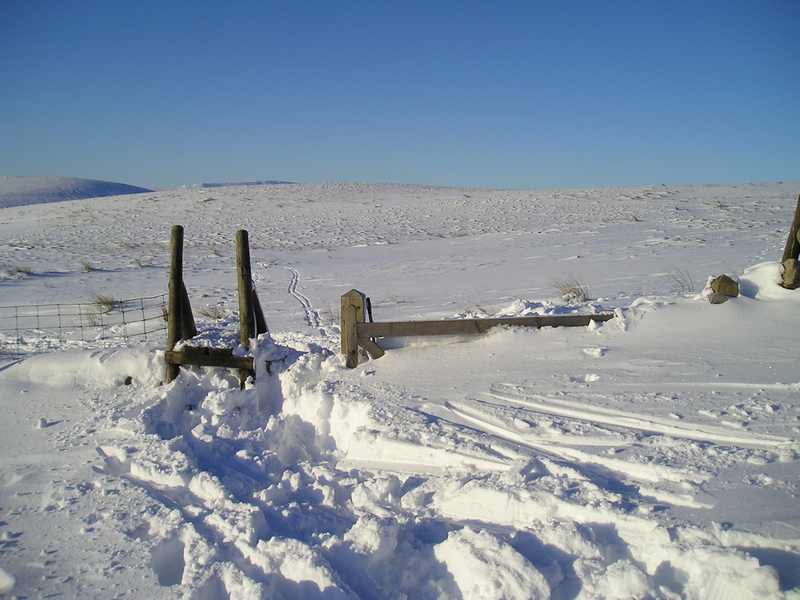 And I missed that January I think as I haven’t been up Penyghent in snow deep enough to ski over the top of the stiles (not that I’d ever dare ski). Great post and photos! As I replied to my friend Connie, this really was a case of ‘right place, right time’. I’ve been really frustrated in recent posts in having to present average images of otherwise stunning scenery – we have to work with the light that’s available, but sometimes I wish I could use it better!! Have you got a lot more hits for this one with the ‘photography’ tag? I know what you mean about having to often present average images – but that’s the way of British walking I think. The light and weather are frequently awful. I often cart my camera around all day and take no pictures, and rare is the day when I come back with beautiful photos. Even on nice days there is often a haze which spoils the distance elements of the photos. Comparing my film photos with your digital ones, I think one of the differences seems to be that digi-cameras seem to really love snowscenes! I think my film camera prefers less bright/start subjects and seems to excel on autumnal shots and even rainy days. Yes, I had 88 hits in the first day, almost double what I would have expected. I’ll remember (and use) that tip! I think you’ve hit the nail on the head re film/digi cameras – I always have to tweak the digi images in anything less than bright and sunny. I’m going to have to go out with strings of cameras round me neck!! Must get back to experimenting with my OM2. For those of us who enjoy the snow, you really have to grab it while you can! Well, in the UK anyway. 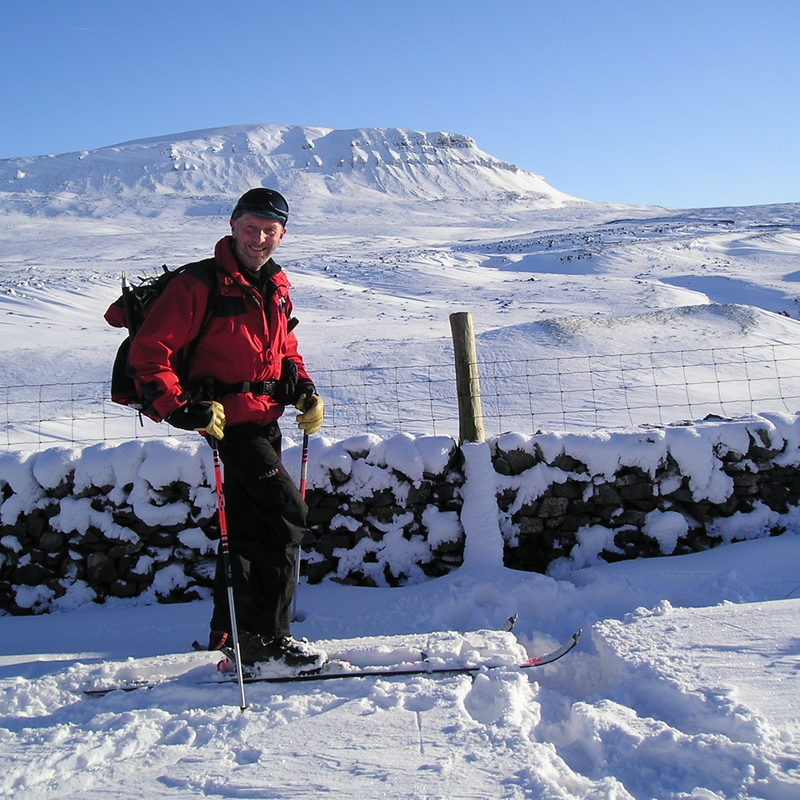 excellent post Paul and the photos are breathtaking…I have never been skiing but I once sledged down Penyghent..that was fun!